Chris Sturtivant, better known among furs as Findra, reportedly died this week at the age of 44. Close friends reported his passing as "sudden and unexpected". Update (21 Oct): A gathering is to be held in Memorial Park (luge n1 w1) on SpinDizzy MUCK from 12-3PM PDT on Sunday 23 October. A memorial meeting will also take place on the afternoon of November 5, at Las Palmas Park. The point was also made last year at the annual meeting of the American Association for the Advancement of Science – publishers of the well-known journal Science. "An unusual wedding ceremony was held in the southern resort town of Eilat on Wednesday, as Sharon Tendler, a 41-years-old Jewish millionaire from London married her beloved Cindy, a 35-years-old dolphin, Israel's leading newspaper Yedioth Ahronoth reported Thursday." Exposing the lies that $leazy World has been telling for decades, Dolphin Reef Eilat, of Israel, is planning another release of captive-born dolphins. The dolphin population there has dwindled and is on the verge of extinction. The efforts of all the countries surrounding the Black Sea (ACCOBAMS Organization), as well as the recognition of the dolphins living in it (TURSIOPS TRUNCATUS PONTICUS) as an endangered species (according to the international CITES treaty), has contributed to significant improvement and rejuvenation of the Black Sea. The transfer of the dolphins from the Reef to the Black Sea is one of the rehabilitation measures, carried out in cooperation between the Severtsov Russian Academy of Science and Dolphin Reef. Two dolphins, Shandy (10 year old male) and Pashosh (12 year old female), born at Dolphin Reef to parents originally from the Black Sea, are being transferred back to the Black Sea. Shandy and Pashosh will fly on Monday, July 26th, from Eilat to the Utrish Biological Research Station at the Black Sea, where they will meet a pair of local dolphins. After a stay of about one month at the Research Station, the four dolphins will be released into the Black Sea. This release project is backed and accompanied by local and international environmental groups, such as the Nature Reserves Authority in Israel and in Russia, and ACCOBAMS organization. Dolphins and sea lion are part of the US troops deployed in the Gulf. Tacoma and Makai, part of the US Navy's Explosive Ordnance Disposal Mobile Unit Three, are the two dolphins charged with helping clear Iraqi ports of misplaced mines. Using echolocation, the mines are found in the silt of the ocean floor. Floats are put in place by the dolphins, marking the locations. The Navy says they face no "significant" risk. Fishing is still killing dolphins, and conservationists worry that the damage could soon lead to extinction. Plans have been brought up to try high tech sound deterrants or net holes to keep dolphins out of fishing nets. But the best way to keep dolphins out of nets is to keep nets out of the sea. 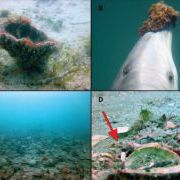 A recent article in the Times of India tells of how dolphins are being trained to plant limpet mines on enemy ships. Similar articles appeared today in the Economic Times of India and The South China Post, focused on the outcry from animal activists. While I could not find any links to these articles I have included relevant portions. Parrots, apes, and elephants are people, too. According to a Wired Article, scientists are attempting to develope a common language for humans to use in communicating with dolphins. This sound-based language will likely be examined as closely as the sign-language that are used with our simian cousins... although, from the statements in the article researches don't expect it to ever reach that level of sophistication.